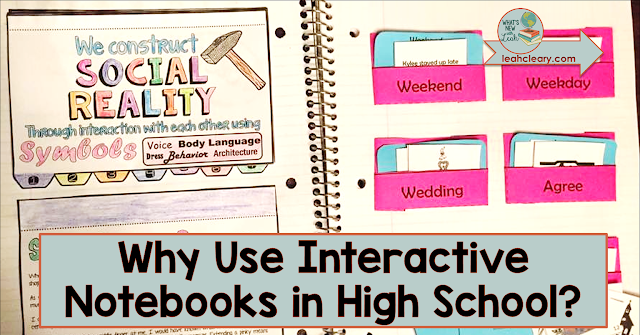 Why Use Interactive Notebooks in High School? Most high school teachers have strong opinions about Interactive Student Notebooks (ISNs). They either love them or hate them. They see the benefit of using them or they see them as too juvenile and a time drain. Students are the same. When first trying to implement them a few years ago, I heard the common complaint from students, "Why can't we just get a three-ring binder and a three-way hole punch? It would be so much faster." I'm going to answer that question for you, as well as a series of other frequently asked questions that I get about ISNs in high school. But if you have no idea what ISNs are, you might want to start with this video, and then come back to this post. I promise, ISNs are worth at least considering. Q: Why are you still doing paper ISNs when your school is 1:1? Isn't that a waste of paper and time? A: I implement Blended ISNs mindfully. This means that I take the best of both formats and merge them. Research has shown the benefits of interacting with physical materials and the positive effects of writing, coloring, and doodling on memory. In digital format, many of these benefits are lost--especially in note-taking. My friend and colleague, Math Giraffe, has written an excellent blog post about these benefits and the problems with going completely paperless. Q: How do students stay organized going back and forth between digital and paper? That sounds confusing. Be sure to download my free Blended Interactive Notebook Handbook here. Q: Why do you waste time cutting and gluing when it's so much faster to use a three-ring binder and a three-way hole punch? 1. They can't take the papers out, so they don't lose them. 2. It's nice to be able to say, "Turn to unit 3, page 5," and everybody has the same thing there. Papers have a tendency to move around or become lost in a three-ring binder. 3. Students take ownership of these--they become their creation. They have built it. In building it, they are more likely to be aware of contents and more familiar with the material. Read on to find out how I avoid making the cutting and gluing a waste of time. Q: When do you give the handouts to the students? A: I give students most of the handouts on the day we begin the unit. I have a table in my classroom where I place handouts, and students pick them up when they enter. My desks are set up in groups of four, and each group has a box containing scissors and glue. Here is how I set up my classroom and free desk labels. Q: Do students have an empty notebook where they glue all the handouts? A: I tell students to purchase a large 100 to 200 page spiral notebook. By large, I mean 8.5 x 10 or 11. They can go smaller, but then they have to trim pages. I keep all of this from wasting time by teaching them how to put it all together at the beginning of the semester. Then, any day we begin a unit, I set a timer for 15 minutes because I have found they will take all the time I give them and if I don't give them a time-limit, they will drag it out. So all of the class time I give them to set up each unit is 15 minutes. Here is a great timer to use. 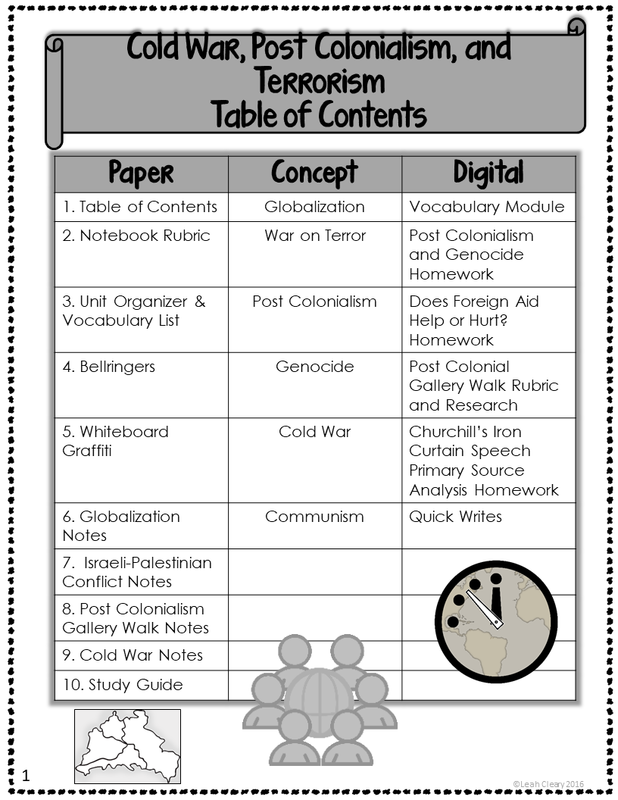 At the start of a unit, the first thing I have students do is to look at the table of contents (always on page 1) of each unit. They go ahead and number each page in their notebooks right away to "hold" pages for handouts they may be getting another day (such as more complicated foldables we will put together as a class--I use these sparingly and, again, mindfully). Q: Aren't ISNs more for elementary and middle school? A: The ones that are made for elementary and middle-schoolers are. 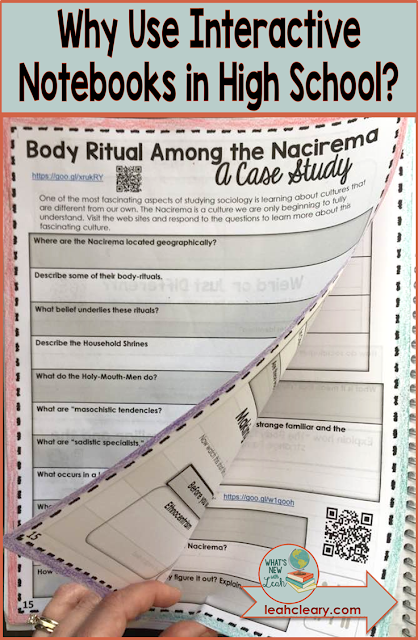 A high school ISN will have coloring and foldables, too (though mine aren't heavy on foldables--I use ISNs more as an organizational tool), but the content is geared for high school. We are trying to help our students' learn, and the research says that visual note-taking, doodling, and coloring help them to process the information better. Here is a video (again, from my friend Math Giraffe) that explains this phenomenon. Q: Do students glue the bellringers in their notebooks? How do you check their bellringers and other work? 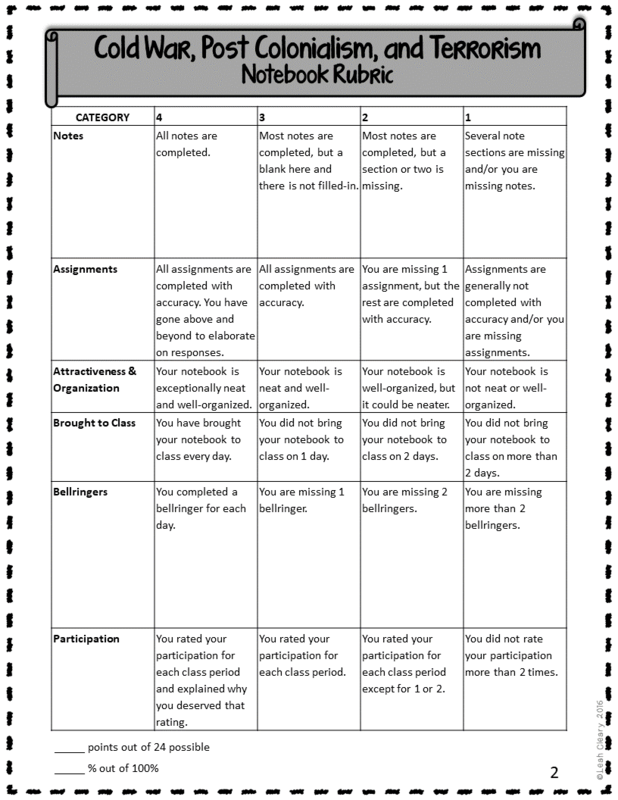 A: I think routine and consistency are important, so I have students glue bellringers into page 4 of each unit in their ISN. I walk around the room during the bellringer and initial pages (homework or classwork) for on-time completion. At the end of every unit, on test day, I take up their ISNs and grade the unit using a rubric (students glue it onto p. 2 of each unit). This is tedious at first, but it becomes very fast once you get used to it. I haven't taken a box of these notebooks home in years. The grading and feedback of the ISN are important because it ensures students keep up with them. Q: Do students turn-in any work at all to you or does everything go in the notebooks? Do you use interactive notebooks in high school? If so, how do you implement them? If not, what are your reasons? Leave a comment and let me know! And if you're looking to dig deeper into blending and ISNs, check out my course here.